One major piece of news which broke when Curling Today was off line recently was that the World Curling Federation announced the first-ever challenge from a South American member association, Brazil, to the United States of America for a place at the 2009 Ford World Men’s Curling Championship. The press release can be read here. Canada is the host nation for the World event next year in Moncton. Brazil, a WCF member since 1998, will challenge the US for the second America's berth. The United States will host the challenge series in January 2009 at a location to be determined. “The Brazilian challenge marks another milestone in the development of world curling,” said Les Harrison, WCF President. My first reaction was, "Great - now we'll get some colour on to the ice!" But then the old cynicism kicked in. Last December I got excited when I learned that a Brazil team was entered into the first World Mixed Doubles Championship (see here). 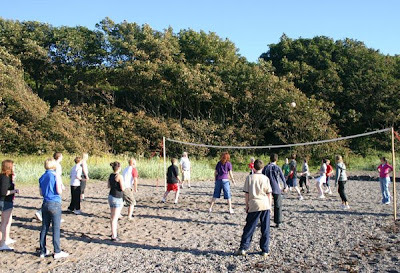 But that country failed to show for the event in Vierumaki, and as a consequence was banned from competing next season. Brazil, if it wished to enter the next World Mixed Doubles in Cortina, in April, it now cannot! (Neither in fact can Germany, Ireland, Kazakhstan and the Netherlands - the WCF sanction for entering an event and then withdrawing). So, first question, will a Brazil team actually show for the challenge? Who are the curlers? Apparently they are five Brazilian nationals who are currently studying at the University of Sherbrooke in Quebec, Canada. They train at the Lennoxville Curling Club. No names have been released as yet! The challenge will comprise a best-of-five series of matches, held over a three-day competition in January. Patzke says, "We are still determining where and when the challenge will be held, and how we will select our team. I hope to have this information to present to the WCF for approval within the next couple of weeks." It will not be an easy decision for the USCA to decide who should defend their place. All the top US men's teams will be involved in January 2009 in their National Championships, and the top six then will be preparing for their Olympic Trials, in Denver, Colorado, February 21-28. Scotland is no stranger to facing challenges for a place in the World events. Indeed, that challenge now has to be faced every year, as the European Championships double as the qualifying competition for the World Championships for European teams. This month's announcement will be seen by many as a good thing for the sport, that Canada and the USA should not have an automatic right to places in the World Championships! Scotland's junior curlers have their own challenge to face next season (see here). Glen Muirhead's team have to play in the European Junior Challenge Competition in Taarnby, Copenhagen, early in January, to try to win one of two qualifying places for European teams for next season's World Junior Men's Championship in Vancouver. Top: Brazilian curlers model their new uniforms for next season. I wish! 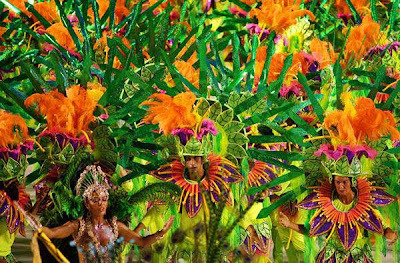 Actually it is an AFP pic of Sao Clemente samba school dancers performing during the first night of the carnival parade at the Sambodrome in Rio de Janeiro, found here. Other Carnival photos are available, but most not entirely suitable to illustrate a family curling blog - as the Editor decided after hours of research!! You may well already have seen the post on the Royal Club website (here) which purports to be looking for wheelchair curlers for the GB Squad for the Vancouver 2010 Paralympic Games. You may well have been puzzled by it, as indeed I was, as the GB Squad was announced way back on May 1 (see here), and is shown above. What British Curling, and its Wheelchair Curling Coach Tom Pendreigh, are looking for now are wheelchair curlers with the potential to be the Paralympians of the future, in 2014 and beyond. Athletes who register their interest by the end of September will be tested at a number of events next season. The tests are based on curling figures. The wheelchair curlers will be scrutinised for directional accuracy using a plumb line and camera, and for weight control using laser time gates. The tests will be scored and the results recorded. The top fourteen ranked athletes will be considered for Podium or Development Programmes and be eligible for Scottish Institute support. These tests and the ranking procedures are aimed at experienced players, not beginners. 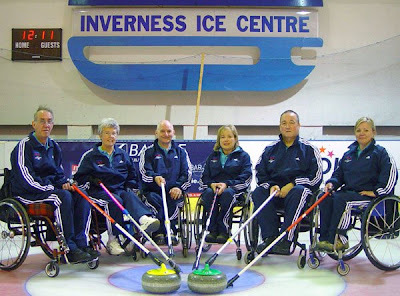 The five events where the tests will take place are (1) a Scottish Wheelchair Curling Association Integrated Performance Camp, at Perth, October 3, (2) the National Pairs, October 31, at Braehead, (3) the British Open, November 28, at Kinross, (4) a SWCA Integrated Performance Camp at Braehead, January 23, 2009, and (5) the Scottish Championship in Aberdeen, March 20, 2009. Registered athletes are required to participate in at least three of the five events. Closing date for applications is September 20, 2008. The squad for Vancouver 2010. 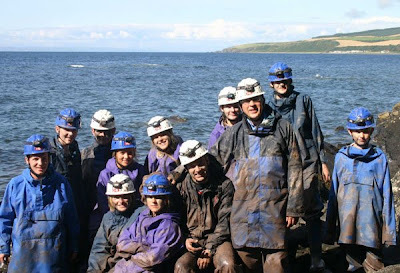 L-R: Jim Sellar, Rosemary Lenton, Michael McCreadie, Aileen Neilson, Tom Killin and Angie Malone. Photo by Hugh Stewart. In the days before political correctness there was a curling sticker which said, "Blondes have more fun on fast ice." Now I have no confirmation of the veracity of the statement, but I was reminded of it this morning when I received a call from the secretary of the Liudmila Privivkova fan club to tell me that the Russian skip (pictured above) will be bringing her team again to Braehead next January for the second Glynhill Ladies International! The news just in (here) is that the organisers of the WCT-e event, January 16-18, 2009, have achieved their target to increase the entry to 24 teams. Indeed, 16 foreign teams and 8 Scottish teams are in the draw, and there is already a waiting list. 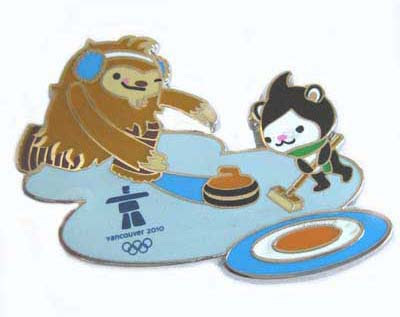 Curling Today has already flagged up (here) that the 2008 World Champions from Canada, skipped by Jennifer Jones, will be competing at Braehead, along with World Silver Medallists, Bingyu Wang’s team from China, and World Bronze medallists from Switzerland skipped by Mirjam Ott. In addition, the top home sides will face challenges from Moe Meguro (Japan), Shari Leibbrandt (Netherlands), Binia Feltscher-Beeli (Switzerland), Karina Toth (Austria), Linda Klimova (Czech Rebublic), Kirsty Balfour (England), Petra Tschetsch (Germany) and three Russian sides skipped by Liudmila Privivkova, Margarita Fomina and Anna Sidorova. There is a strong Swedish entry too. Anna Hasselborg brings her team back to Braehead again. Karin Rudstrom's team is from Sveg, and Cissi Ostlund (below) should also have fun if the ice is fast - she lost the final of the World Junior Championship in Ostersund in March. The Glynhill is the only women's WCT-e event in Scotland. Put the dates in your diary! The event website is here. I have a fondness for the Inverness Ice Centre! 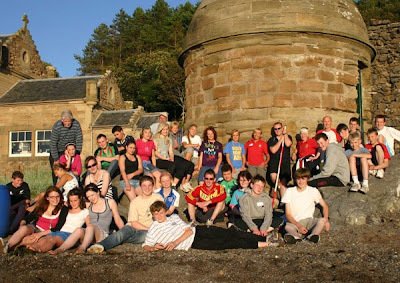 I had some great times there when I used to compete, and more recently I have been warmly welcomed when reporting on hugely successful events, such as the Skins, the Curlathon, the Highland Junior International, and the World Wheelchair Qualifying Competition. I have been heartened to see the improvements that have taken place since it was bought in 2002 by the users of the rink. Earlier this month I travelled north and enjoyed a special occasion when the rink's birthday, and curlers' achievements, were celebrated in the Town House (see here). I have been very much aware that a lot is happening behind the scenes and that the Inverness Board has ambitious plans for the future. These plans are still at an early stage, but yesterday the Inverness Courier has broken the story and revealed something of what might happen in the years ahead at the Inverness rink. The original article is here. I urge you to read it. It puts into perspective the difficulties that many rinks around the country are facing, particularly in a time when running costs are increasing so rapidly. But Chairman Tom Pendreigh is positive about the future. He says in the article, "I would expect to have an independent ice skating facility alongside an independent curling facility." Inverness would be a regional centre of excellence for curling and a national centre of excellence for skating! The facility would also have strong links with the proposed new University of the Highlands and Islands' campus, with educational opportunities in the science of ice-making. Now, isn't that an interesting idea! The Centre's ambitions receive support in an Inverness Courier editorial. It says, "The potential is enormous. A dedicated curling arena with spectator seating could attract a host of major competitions and encourage the next generation of Olympians in a sport in which the region already excels. An expanded rink could do the same for figure skating and ice hockey while doubling as a venue for conferences and concerts. Other options include a museum of curling, which would be an additional tourist draw alongside the new archive centre. We urge those involved in the current talks to push ahead and seize the moment. There will never be a better time to seek support and funding than when politicians in both Edinburgh and London are basking in the reflected glory of sporting achievement." Yes, there will be major hurdles to overcome, but today let's commend and support the efforts of those who are working towards a positive future for ice sport at Inverness. 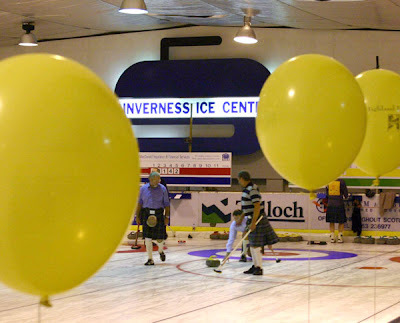 The balloons at Inverness were at the 2005 Curlathon. Was that really three years ago? Photo by Bob. Did you watch BBC Scotland's new reality television programme last night? Primetime's aim is to champion health, wellbeing and fitness for the over 50s. The programme highlights 'projects that will help make older people in Scotland healthier and give them a sense of wellbeing, as well as encouraging better links between different generations'. All well and good! In a series of six programmes BBC Scotland gives the decision to viewers how £3 million from the Big Lottery Fund will be spent. One project from three highlighted each week will be the winner. Why am I uneasy? 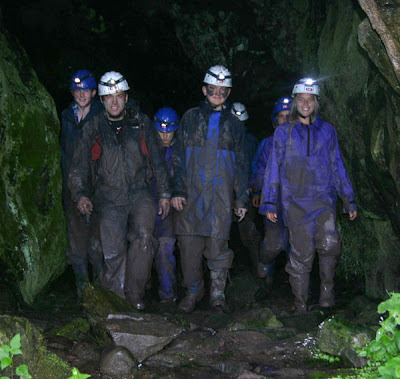 Having watched the first programme last night I am convinced that ALL the projects described deserved to be funded! That's perhaps not surprising as they will have gone through a rigorous selection before getting to this stage. I'm uncomfortable because the decision rests with me, the viewer, with limited background information on which to make a reasoned decision. The programme makers are asking the viewers to decide on a superficial 'impression' gained from watching an eight or nine minute televised presentation. No opportunity to ask questions, or find out more about the projects. Of course, I know that supporters of all the projects will already have been out canvassing to get as many friends or relatives to make the all important phone calls which will decide which group gets the money, and, more importantly, which does not. I'm uneasy, because this is not really entertainment. It is not 'Strictly Come Dancing', nor is it even 'Restoration'. One of the projects last night involved support for patients in the early stages of dementia, and their carers. Another involved personal safety programmes to help old people cope better with issues such as crime, racism and home safety. The third was a volunteering project using outdoor and educational activities to improve life for the over 50s in deprived areas of Dundee. The programme was educational, certainly. I am just uneasy that one of these projects will get the money asked for, on the basis of a few viewers' votes, and the others, 'will leave with nothing'! Perhaps with the exposure gained, money will be more easily found from other sources for the two 'losers'. I write all this because my email has been full of exhortations to vote next week for the Time to Curl project. This is the bid by the Border Curling Development Group (in the photo above) at the Kelso rink. It is an excellent project! The essence of the bid is on the Primetime website here. It says "Participating in team sports is a great way to encourage new friendships while building up physical fitness. 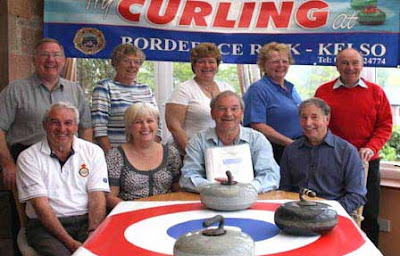 Border Curling Development Group, through their Time to Curl project, aim to encourage over 50s in the Borders area to take part in a variety of activities linked to the sport of curling. Key to the project is the purchase of a minibus so that Time to Curl will be able to offer access to those with mobility problems as well as those living in isolated areas. Curling is a particularly inclusive sport providing the proverbial level playing field, with people from all age groups and of all abilities - including disabled curlers - able to play on the same team. By providing taster sessions and coaching programmes, Time to Curl will make the sport more accessible to those who are new to it and, over the course of the project, will improve the health, wellbeing and social networks of the over 50s. The project also plans to train existing curlers as coaches, encouraging the over 50s to contribute to their community and feel a sense of improved self worth. Links to an existing schools programme will promote the sharing of skills and experience between the generations, while daytime league competitions will allow participation for all, helping to integrate communities through the many existing clubs in the Borders." I'll be making my allowed five phone calls next Monday evening in favour of this Kelso project. Many of the ideas could be rolled out in other rinks throughout the country. I'm supporting it because I'm a curler, a fan of the game, not because I think that Girvan’s Community Garden and the Lifelong Carers project should not be supported too. I'll continue though to harbour reservations about the whole concept of the Primetime programme. Look at it this way. You know that the Royal Club is currently in the process of making the decision on who should get the funding available to build the National Curling Academy, Ratho or Kinross, see the previous post here. On this subject I see that new RCCC Director Willie Nicoll has been asked to join the Working Group because of his management and business experience. Colin Grahamslaw, the RCCC CEO now becomes the Secretary of the Working Group, no longer a voting member. The Working Group, which includes Anne Malcolm, Jeanette Johnstone and Lockhart Steele, will prepare a report for the whole Board which will make final decision in October. Why bother? Let's just give all of Scotland's 14,500 curlers a vote and ask them to decide where the NCA should be? Or we could just toss a coin? 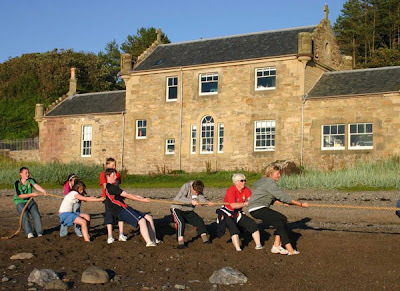 Or play a reality TV 'game', and get people to phone Cairnie House in favour of one site or another? Of course not. And that is why I will continue to have my reservations about BBC's Primetime, despite its worthy aims. Improving health, wellbeing and fitness in the over 50s is not a game. Curling Today is back, refreshed and raring to go for a new season! The Scottish Curler magazine will be returning too. I'm working on the first issue already and if all goes well the October magazine will go into the mail to subscribers in the last week of September. The team are in training! So what curling is there to look forward to in September? Politics thankfully will take second place to seeing curlers enjoying their sport again as rinks open for action! The men's teams of the World Curling Tour-Europe have an early season start at the Baden Masters. David Murdoch's side are the only Scottish representatives in this sixteen team triple knockout event, September 5-7. Later in the month, September 25-27, twenty women's teams and twenty-five men's teams will compete in the Radisson SAS Oslo Cup. I see that the provisional lineup for that event includes Team Murdoch as well as the John Hamilton and Peter Loudon teams. 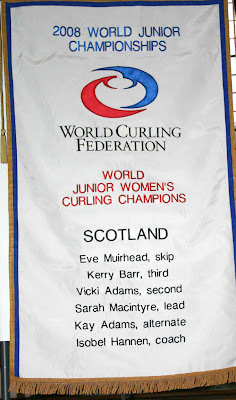 Four Scottish teams are in the women's event under the names of Kelly Wood, Gail Munro, Sarah Reid and Claire Milne. More nearer the time! No live webcasting yet from most WCT-e events, although Swiss Sport Television will broadcast a curling game on Sunday mornings. It will be interesting to see if that can be picked up on the web here. Looking at some of the sports in the broadcaster's archive on the website menu, the quality is pretty good. Click on 'Bob' to see! All right then, click on the 'Cheerleading' button! The WCT-e has a newsletter. Download the most recent issue here. Much credit to WCT-e Tour Director Armin Harder in his efforts to create a better, more professional tour, on high quality ice, with more venues, and increased prize money through television and sponsorship! I'll try to make sure that Curling Today highlights the best of curling in Europe, and how Scotland's top teams get on in the months ahead! The European Mixed Championship is in Kitzbuhel, Austria, September 22-27. The event website is here. Alan Smith and his team of Gillian Howard, David Mundell and Karen Strang are our representatives. Should be a great competition. At home, I'm looking forward to the Greenacres Junior Invitation at the Renfrewshire rink September 19-21, and that will be the first opportunity to see some of the new junior sides in action this season. Before that I hope to see some of the National Squad teams on the ice at Aberdeen. And Greenacres will also host a weekend for the country's Regional Academy athletes, an initiative of RCCC Performance Development Coach Rhona Martin. Remember Primetime? The first programme in the series is tonight. Kelso's bid comes under scrutiny next Monday. Get ready to vote. But more about all this before then. Just a reflection on the past couple of weeks. Congratulations to Team GB at the Olympics in China. Super coverage too on the BBC! Success and failure! The emotions! Of course next time, in around sixteen months time, all attention will be on the Winter Olympics in Vancouver. These months will go by quickly. Have you met Miga and Quatchi yet, two of the Vancouver mascots? If not, check them out here. Keen curlers they are too! This pin is available on eBay. Curling Today is going offline! Hopefully the blog will be back August 25 or thereabouts. 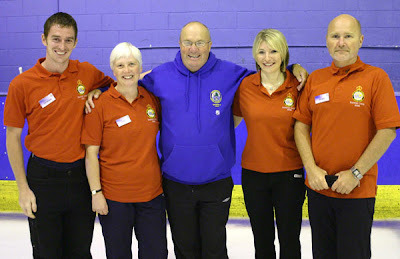 Check out the Royal Caledonian Curling Club website for news in the interim. Thanks to all for your support over the last fifteen months. New Royal Caledonian Curling Club Chairman Bob Tait has today issued a statement (which can be downloaded here) which indicates his commitment to solving the issues which have hung over Scottish curling since March. At the Ford World Women's Curling Championship in Vernon, the Scottish team played the last two round robin games with just three players, in the face of media reports that a member of the squad had refused to play for the team. An independent investigation was promised in a statement posted on the RCCC website on March 29 (here). This independent investigation has not taken place. In the months since Vernon, little or no information about what has been happening has emerged from Cairnie House, the excuse being that formal complaints had been made, and that disciplinary procedures were in train. A Conduct Panel was convened, but its recommendations have not been made public. There appeared to be a complete disregard for members' concerns that the matter would be investigated, and lessons learned. The lack of information, the failure to keep the membership informed, and the passage of time with no apparent action, led me to post my own frustrations here. One member, Michael Barron from Inverurie, has gone so far as to file a formal complaint against Lyndsay Wilson, as recently as last month, presumably in the light of the RCCC's apparent failure to act. But things have changed with the appointment of Bob Tait as the new Board Chairman. He has been able to reach agreement with the main parties involved to allow an investigation to go ahead. Vice President Bill Marshall is now the Responsible Officer under the Ethics Manual and is responsible for Barron's complaint and will advise Mr Barron that he will await the report from the investigation before further considering that complaint. Michael Nicholson of Harper Macleod, Solicitors, in Glasgow, has been appointed to carry out the investigation. His report is to be complete by September 5, in time for the RCCC Board meeting on September 12. An update to members is promised thereafter. Why has this happened now? When the Conduct Panel was convened Gail Munro and Lyndsay Wilson made the suggestion that they would suspend their complaints against Derek Brown, the National Coach, if an investigation into all aspects of what occurred in Vernon was undertaken. The Royal Club Board has decided that this is the way to proceed! 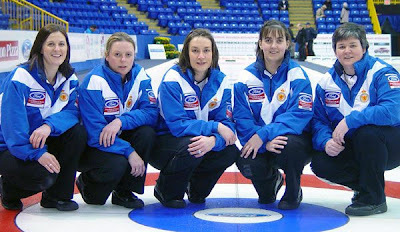 To conduct an investigation into the events that resulted in the Scottish team at the Ford World Women’s Curling Championships at Vernon in March 2008 playing 2 games with 3 players, and the events in Vernon following each of these games. To provide to the Chairman of the Board of the RCCC a written report on the facts found by the Investigator and to make recommendations on actions, if any, to be taken. The Investigator will not recommend specific disciplinary sanctions. The report will be sent to the Chairman of the Board of the RCCC by 5th September. The report will also be circulated by the Investigator to all Scottish team players at the event, the National Coach, the Team Coach, Support staff and the RCCC representative at the event. The report will also be placed on the RCCC website no earlier than 48 hours after it was sent to the parties. The RCCC shall appoint the Investigator who shall be a lawyer. The RCCC shall meet the Investigator’s costs. The Investigator will be provided with a brief summary about the event prepared by RCCC (e.g. how the team qualified to represent their country, coaches etc), copies of the complaints made by Mr Brown and Mrs Munro and a member of the RCCC, copies of the response to these complaints and any correspondence regarding the complaints and responses; copies of the contracts signed by the team, a list of contact addresses for the RCCC party, a copy of the RCCC Ethics manual and all rules and regulations of RCCC (including the Memorandum and Articles of Association and Bye Laws of RCCC), copies of comments about the events from third parties and as reported in the Press, copies of the statements on the RCCC web and, if available, a copy of Mr Brown’s Press interview. The Investigator will invite statements from, and may invite to interview, all Scottish team players at the event, the National Coach, the Team Coach, Support staff and the RCCC representative. He/she may also invite statements from supporters and others he/she considers may assist his investigation. The parties agree that the disciplinary proceedings against Mrs Wilson, Mrs Munro and Mr Brown will be suspended during the investigation. Any of the parties who choose to incur costs shall be responsible for these costs with no liability passing to the RCCC under any circumstances. The parties accept that the Investigator’s report shall be admissible as evidence at any proceedings that may follow. The report is not binding on any individual or panel hearing these proceedings. The parties agree that this note shall be placed on the RCCC web and shall be sent to the Chair of the Ladies Standing Committee, Area, Province and Club Secretaries and that otherwise there shall be no communication of any kind (written, oral, electronic) with the media or parties not party to this note before the Investigator’s Report is published." It is good to see that Bob Tait has given his email address in his announcement today, so that members with concerns may write directly to him. So, given the proviso of the last paragraph, I suspect there will be nothing more for me to write about until September, on this subject at least! The photo of the Scotland team at Vernon is by Hugh Stewart. L-R: Lynn Cameron, Anne Laird, Karen Addison, Lyndsay Wilson and Gail Munro. 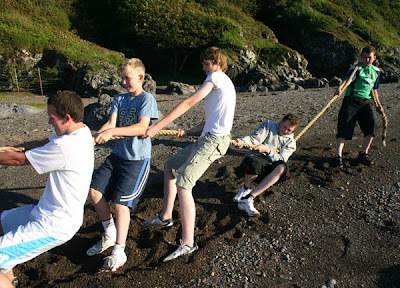 The second Royal Caledonian Curling Club camp of the summer is on this week, again using the facilities of the Galleon Centre, Kilmarnock, and the Dolphin House Outdoor Education Centre at Culzean. And before I go any further, I think that appreciation should go to the staff at the Galleon for providing the good curling ice outwith the season, and for the instructors and staff at Dolphin House who drive the youngsters hither and thither, feed them, and provide a cocktail of fun and adventure! This is the first year that there has been demand for two camps. And it's the first year to include a group of young curlers from Norway. 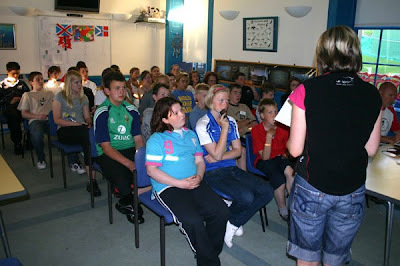 Twenty eight young curlers, aged 12-17, are at camp this week. The first camp was described here. Above and below are some pics from yesterday. Top: the group on the beach at Dolphin House yesterday. The hard working coaches. L-R Graham Sloan, Kay Gibb, David Horne, Judith McFarlane, Brad Askew. The Norwegian visitors. L-R: Coach Kirsten Gronset, Silje Reite, Eli Skaslien, Ingrid Gronset, Kristine Stulen, Pia Trulsen. Pia showing her Olympic genes! 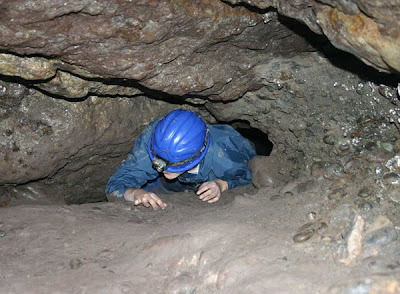 A head emerges from a narrow opening way down in the caves below Culzean Castle. The Editor found he was too big to get through this squeeze, and got well and truly stuck. In fact it took considerable pushing from instructor Kenny Dunlop and pulling from Graham Sloan (thanks guys) to get him out of the plug! All in a day's work of course, for your intrepid reporter to bring you the latest for Curling Today! 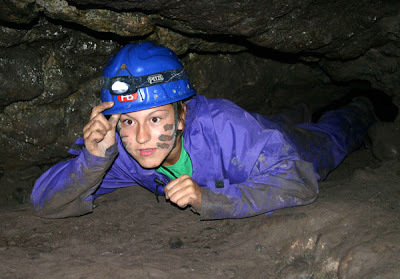 Janine Phillips had no problems navigating the tight cave passage. Pulling together in front of Dolphin House. It is not all fun and games. 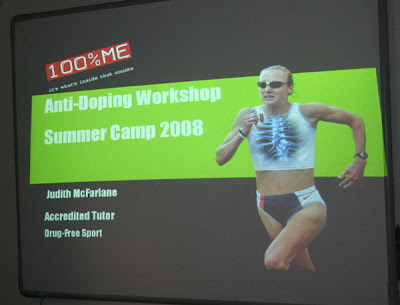 Yesterday's evening seminar was about drugs in sport. Pics by Bob, except where indicated. Thanks to all for a great day! Inverness curlers were honoured yesterday when Highland Council held a reception in recognition of the Ice Centre's fortieth birthday, and the success of many from that rink in national and international competition over the years. Some of them are in the photo above. The rink opened in September 1968. 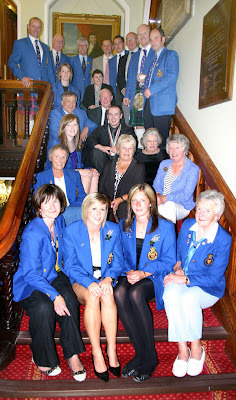 The 'star attractions' in the magnificent surroundings of the Town House were members of Scotland's World Junior Champion team. 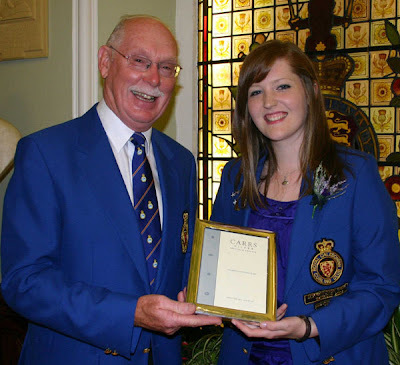 Local curler Sarah Macintyre is a member of the Eve Muirhead rink. Guest Archie Macpherson, the well known broadcaster, spoke passionately about the importance of leisure and recreation. In praising the achievements of the Inverness curlers, he asked, "What do you do with the success?" The answer? Press for better facilities! In reference to the fact that the Scottish Cabinet will meet in the Town House next week, he encouraged all present to tell the Scottish Executive, "We need even better facilities." It was a most enjoyable occasion. Here are a few more pics from the evening. 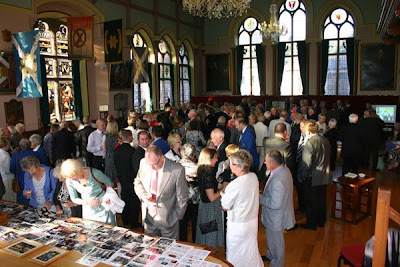 There were lots of old photos on display, and time to mingle and chat. 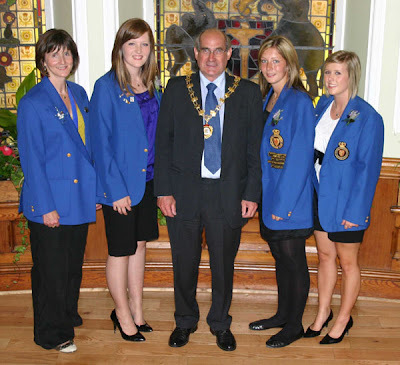 Inverness Provost Bob Wynd with L-R Isobel Hannen, Sarah Macintyre, Eve Muirhead and Kay Adams. RCCC Area 10 Representative Alex Barnet presents a gift to Sarah Macintyre. Remember the WCF banner, which should have been presented at the Royal Club AGM? It has returned from its travels and was proudly on display in Inverness Town House!